Pilgrim Scribblings: A Man Can Dream Can't He? A Man Can Dream Can't He? Instead of adding to my library of 4,000 volumes I find myself in the position where I need to sell or give away literally hundreds of books. Our upcoming move to a smaller home makes this necessary. I've always dreamed of having a separate library in my home with floor to ceiling solid oak book shelves on all four walls. Oh well, a man can dream can't he? Ah, I have to admit that, although I'm not materialistic, I do find it hard to let go of books ... my sympathies! I hope you can find a worthy home for the ones you have to let go. 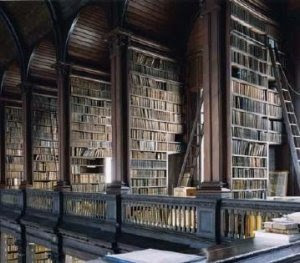 i wonder if heaven will have a library? will we even want to read because the WORD will be Alive and Living with us!